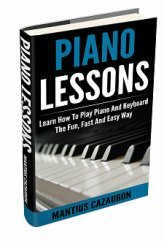 In this lesson, we will learn how to form major scales on piano. This scale follows a simple formula. That formula is whole - whole - half - whole - whole - whole - half or w-w-h-w-w-w-h. "Whole" stands for a whole step on your piano and "half" stands for a half step. So in other words, the formula for forming a major scale is whole step, whole step, half step, whole step, whole step, whole step, half step. What does this really mean? Stay with me and we will find out. It's actually quite simple to form this scale as long as you understand the concept of whole steps and half steps. What do whole steps and half steps mean? Whole steps and half steps describe the distance between two notes. The distance is either a half step or a whole step. On piano, a whole step always skips a key. For example the distance between C and D is a whole step. We skipped a key. We skipped the key, C sharp. It's that simple. The distance between D and E is also a whole step. What key did we skip? We skipped the key D sharp (also known as E flat). That's how simple it is. Just skip a key and we have a whole step. For half steps, no key is skipped. So If we are on C and we move to C sharp, you guessed it. This is a half step. If we are on D and we move to D sharp, this is a half step. 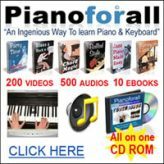 Now that we understand what a half step and whole step is, let's go back to our formula, w-w-h-w-w-w-h.
With this formula, we can start on any key on the piano and form a major scale. Let's start on C. We are going to form a C maj scale. Starting on C, let's move a whole step higher. This takes us to D. Let's move another whole step higher. This takes us to E. Following our formula, let's move a half step higher. This takes us to F. From F, we move a whole step higher. This takes us to G. From G, we move a whole step higher. This takes us to A. From A, we move a whole step higher. This takes us to B. From B we move a HALF step higher and this takes us to C. There we have it. 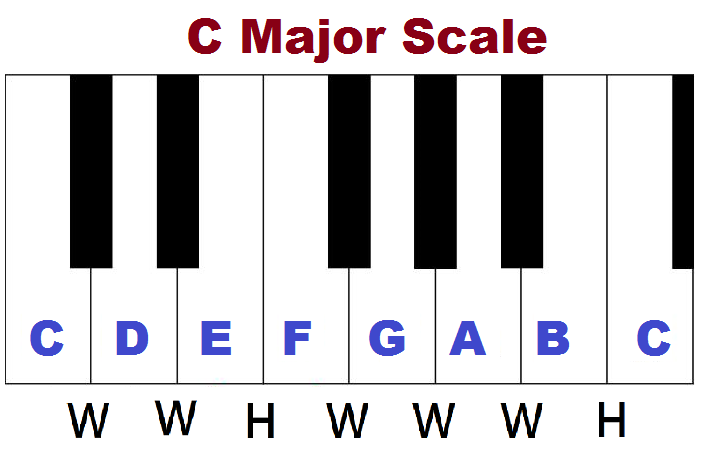 A C major scale. That wasn't hard. All we did was follow the formula, w-w-h-w-w-w-h and we came up with the scale. 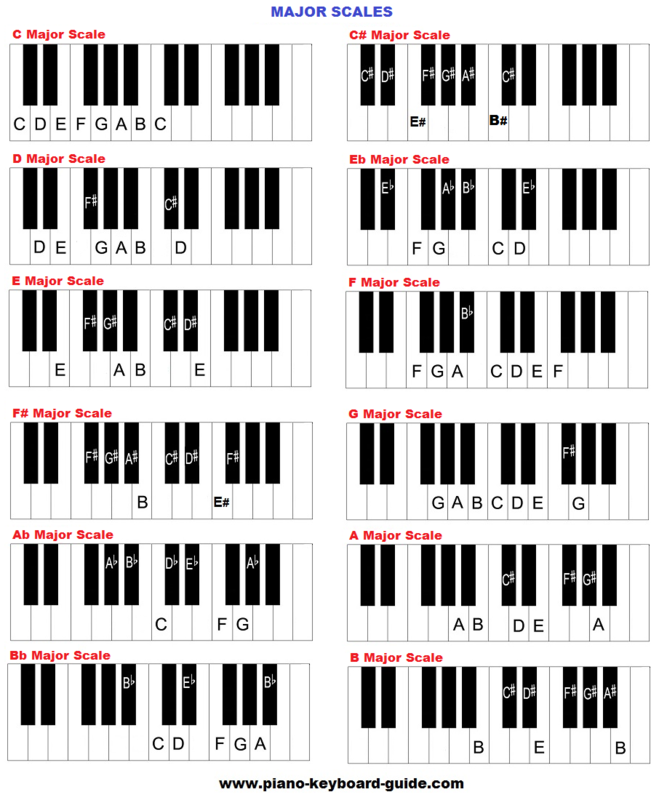 In case you're not sure about the note names of all the keys, go here for a piano keyboard diagram and explanation. Let's form another scale, a G major scale. Starting on G, we move a whole step to A, a whole step to B, a half step to C, a whole step to D, a whole step to E, a whole step to F# (Notice how we skipped a white key), and finally a half step from F# to G.
Wanna try one more? Let's start on F. From F, we move a whole step to G, a whole step to A, a half step to the black key, Bb. From B flat we skip a key and move a whole step to C, a whole step to D, a whole step to E and a half step to F. There we have it. The F major scale. So clearly, as long as we have our formula, w-w-h-w-w-w-h, it's easy to form any maj scale. We can start anywhere on the piano. The Dmaj scale: D, E, F#, G, A, B, C# D.
The Emaj scale: E, F#, G#, A, B, C#, D#, E.
The Amaj scale: A, B, C#, D, E, F#, G#, A. The B flat maj scale: Bb, C, D, Eb, F, G, A, Bb. I trust that you have a clearer understanding of this subject.